Your brain is your nervous system’s all-important command center, so make sure you give it the nourishment it requires. But is there really such a thing as "brain food"? Plant-based omega-3 sources, including walnuts, flaxseed, and chia seeds, make great brain food. Although diet isn’t the only factor that affects your brain’s prowess, it’s an important one, so let’s examine some of the smartest foods for your noggin—and then review the types of food you should avoid. Is the right fat where it’s at when it comes to brain food? Unsaturated fats may have the opposite effect of saturated and trans fats on your heart and brain; they may help protect and preserve your memory. Diets that contain plenty of healthy, unsaturated fats have been linked to lower rates of dementia and mild cognitive impairment. Unsaturated fats are considered healthier fats. There are two main types of unsaturated fat: monounsaturated and polyunsaturated fat. The richest sources of unsaturated fats are avocados, nuts, seeds, and vegetable oils. Examples of foods rich in monounsaturated fat include olives, olive oil, and avocados. Foods high in polyunsaturated fat include walnuts, flax seeds, and sunflower seeds. These foods support brain growth and development. Vegetable oils, nuts, and seeds, although they’re considered brain food, should be consumed in moderation because they’re high in calories. Omega-3 fatty acids (omega-3 fats) are a type of polyunsaturated fat. They’re associated with lowering blood pressure, raising HDL (“good”) cholesterol, and reducing the risk of some neurological disorders. Omega-3s also are associated with better memory. Omega-3 fatty acids are found in cold-water fatty fish, such as salmon, mackerel, lake trout, herring, and sardines. Plant-based omega-3 sources, including walnuts, flaxseed and flaxseed oil, and chia seeds, make great brain food. You can support optimum cognitive function and improve the health of your blood vessels with the help of nutrient-dense, antioxidant-rich vegetables and fruits. Dietary patterns that contain plenty of whole or minimally processed fruits and vegetables are linked with a lower stroke risk. 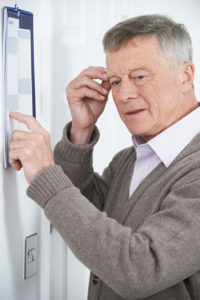 You are more likely to experience impaired memory and cognition if you have a stroke. The following nutrients have been linked with better brain health. They come from smart food choices that provide us with the energy needed to focus and learn while helping to protect against brain diseases. • Alpha lipoic acid is an antioxidant that has been shown to improve memory deficits and reduce cognitive decline in some studies. It is found in vegetables such as spinach, broccoli, tomatoes, green peas, and Brussels sprouts along with potatoes. • Vitamin E is another antioxidant that has been linked to improved memory and cognitive performance. Good sources of vitamin E include green, leafy vegetables such as kale, spinach, Swiss chard, and mustard and turnip greens, as well as asparagus, almonds, and sunflower seeds. • Vitamin B6, vitamin B12, and folate are linked with lower homocysteine levels, which are associated with a lower risk of cognitive decline and Alzheimer’s disease. Legumes (beans, peas, and lentils), nuts, whole wheat, quinoa, brown and wild rice, and millet are good sources of these B vitamins. 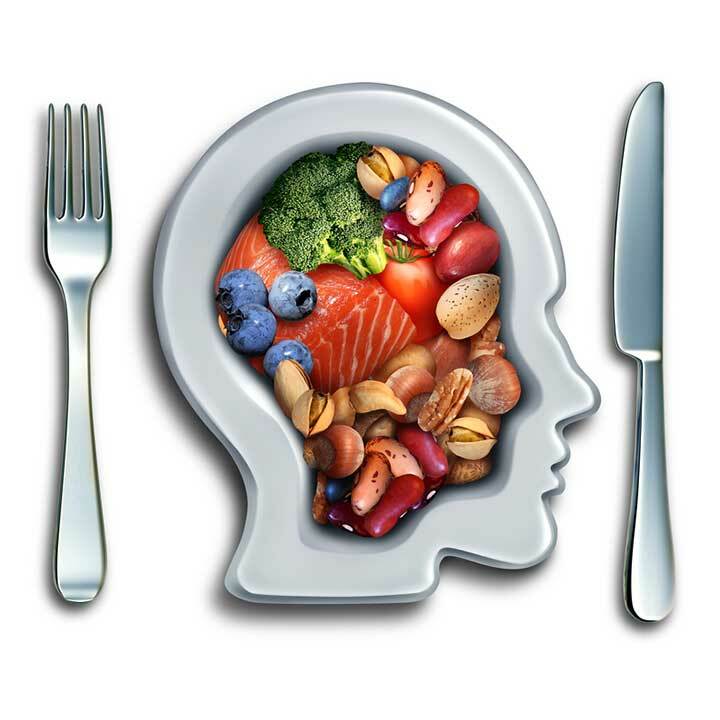 If you eat plenty of plant foods and fish and limit your intake of saturated and trans fats and added sugars, you will support your brain’s abilities to remember, concentrate, make decisions, and engage in the many functions needed for daily living. And what about foods to avoid? Let’s start with trans fats. Foods that contain industrially produced trans fats are known to raise LDL (“bad”) cholesterol levels and lower HDL (“good”) cholesterol levels. Processed foods made with partially hydrogenated oils (PHOs) contain trans fat. PHOs are produced in an industrial setting that adds hydrogen molecules to liquid vegetable oil. The process makes them solid at room temperature and extends the shelf life of the products in which they are used. The U.S. Food & Drug Administration (FDA) has determined that PHOs are not “generally recognized as safe” and has mandated that food manufacturers remove all PHOs from food products. However, some food products currently on store shelves do contain PHOs, so always read ingredient lists before purchasing. Foods most likely to contain PHOs include stick margarines, shortening, pre-made frostings, frozen pies and pie crusts, biscuit and pancake mixes, non-dairy creamers, microwave popcorn, doughnuts, and fast foods. Saturated fats are most often found in animal-sourced foods, including beef, pork, processed meats, tallow, lard, cream, butter, whole milk, and whole-milk products, such as full-fat ice cream, cheese, and yogurt. Most plant-based foods are free of saturated fat with the exception of palm, palm kernel, and coconut oils. Dietary patterns that are high in saturated fat are known to raise blood levels of LDL cholesterol. Research shows that consuming foods high in saturated fat is linked to lower performance on thinking and memory tests. LDL cholesterol is commonly referred to as “bad” cholesterol because it is the type that is most likely to contribute to plaque buildup in your arteries. Plaque buildup can cause hardening and narrowing of the arteries, which restricts blood flow and oxygen delivery to your brain, heart, and other organs. When your brain doesn’t receive enough oxygen, it cannot function at its best. Links to Alzheimer’s provide evidence of an association between saturated and trans bad fats, raised LDL levels, and poorer brain function. A dietary pattern common in the U.S., often referred to as the “Western” diet, is high in added sugar, as well as processed foods, red and processed meats, and other foods that have been linked to a number of chronic diseases. Diets high in refined sugar are linked to impaired memory. It’s a notable issue for adults as well as children; diets that are high in simple sugars and other refined carbohydrates have been clearly associated with lower cognitive functioning in children. Added sugars include the sweeteners found in candy bars, desserts, soft drinks, and fruit drinks; they do not include the natural sugars found in fruits and milk. Other food products that may be high in added sugar include ready-to eat breakfast cereals, condiments (especially ketchup and barbeque sauces), salad dressings, sports and energy drinks, baked beans, and pasta sauces. Research has shown that the risk of mild cognitive impairment and dementia is increased in older adults who get most of their calories from refined carbohydrates, rather than from protein and healthy fat. In fact, Alzheimer’s is being referred to by some health and nutrition experts as “type 3 diabetes.” To protect the health of your brain, avoid foods made with added sugar. Contributing: Dawn Bialy, Executive Editor of Weill Cornell Medicine’s Women’s Health Advisor. acetylcholine, acetylcholine supplement, almonds, alpha lipoic acid, alpha lipoic acid ala, alzheimer, antioxidant, b vitamins, b12, bad cholesterol, bad cholesterol levels, blood pressure, brain, brain food, brain health, breakfast, calories, children, chocolate, chocolate benefits, cholesterol, cholesterol levels, coconut oil, cognitive decline, cognitive function, cognitive impairment, cognitive performance, dairy, dementia, depression, depression symptoms, diabetes, diet, energy drinks, folate, food, foods to avoid, good cholesterol, hdl, health, health and nutrition, health problems, homocysteine, homocysteine levels, improve memory, improve your memory, improved memory, kale, ldl, ldl cholesterol, ldl levels, lowering blood pressure, memory, memory power, memory tests, mild cognitive, mild cognitive impairment, milk, mood, nutrients, nutrition, nuts, omega 3, omega 3 fats, omega 3 fatty acids, omega 3s, omega 6, plaque buildup, polyunsaturated fat, potatoes, processed foods, protein, quinoa, reduce blood pressure, refined carbohydrates, spices, spinach, stroke, stroke risk, sugar, supplement, to improve memory, trans fat, type 3 diabetes, vegetable oil, vegetables, vitamin, vitamin b12, vitamin b6, vitamin e, vitamins, walnuts, western diet, whole wheat, women s health advisor, womens health, yogurt, your memory. Good refresher on things to eat. Good stuff to know and to follow.